The Kingsman 24" Vent-Free Fiber Split Oak Log Set with Natural Gas Log Burner, and Manual Pilot Kit is a fantastic addition to your Kingsman appliance. 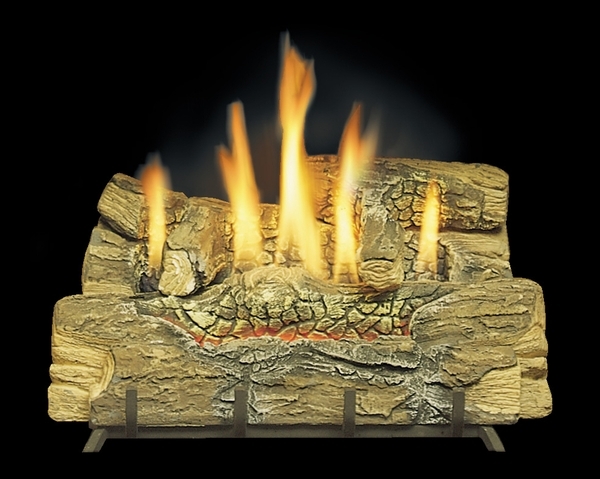 These beautifully detailed simulated split oak logs are made from a durable ceramic fiber which will glow when heated. This Vent-Free Burner System has a reliable on/off manual gas valve, the matchless piezo starter, and a manually operated variable flame control. Kingsman's dedication to safety includes an Oxygen Depletion Sensor which monitors oxygen levels will shut down the burner if they fall below acceptable levels. This nonconvertible Natural Gas burner is Certified to ANSI Z21.11.2-2013, with a BTU Range: 25,500 to 38,250 and Inlet gas pressure: 5 1/2 to 7 inches of W.C. Please Note: The fireplace's Middle Width must be at least 25.75 Inches and the Depth must be at least 12.5 Inches for this gas log set to fit. You can calculate the middle width of your firebox by measuring the width (left to right) approximately half way back in the firebox. If you have any questions, please contact our customer service department and we will be happy to assist you in finding the perfect size gas log set.